The morning dawns crystal clear again. We pack our things and start off. 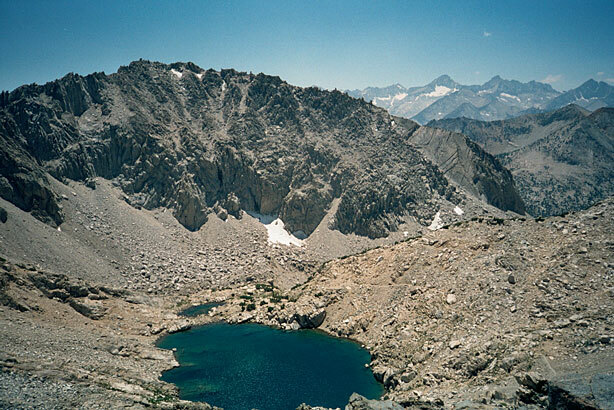 Today our goal is crest Glen Pass: easily one of the more dramatic passes on the JMT. We've both done it before, so we're not braving new terrain. But it's to be our longest stretch in between resupply points. In the next eight days we'll be covering four passes, beginning with this one and then continuing with Pinchot, Mather and Muir Passes. We part company with Dad at the trail junction. It's the last time It will be four weeks until I see him again. We all got up fairly early- had cocoa, green tea, breakfast burritos and packed upand were on the trail by 8:30. We parted at the Kearsarge Lake junction. We watched Chase make the pass (9:35) and Will and I hiked onward. 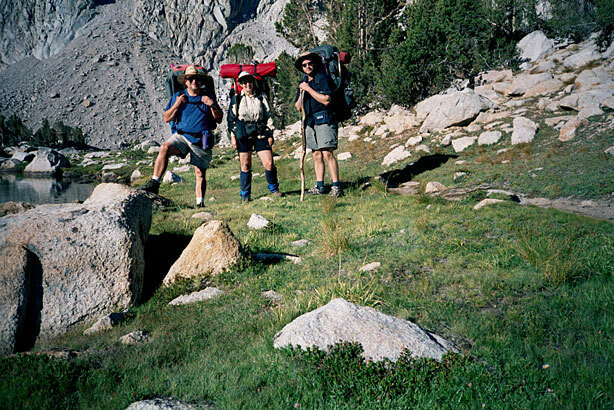 We met a guy who had camped out at the lake too and was on his way to Rae Lakes. We crested the pass first. Looking back the way we came. The trail is faintly visible. Sitting atop Glen Pass. You could not BEG for better pass-bagging weather. Mom's a short distance behind me, toiling up the final switchbacks. 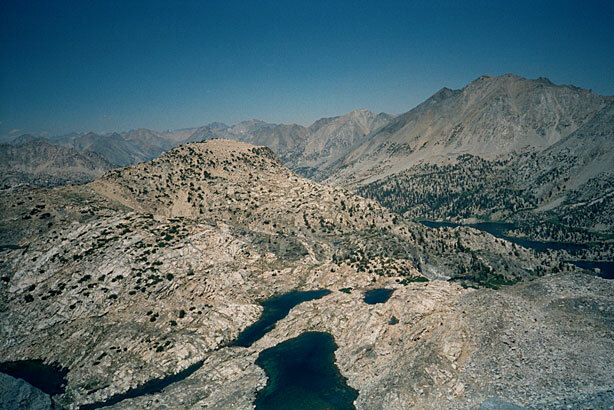 The vast basin below is scattered with lakes, many of them rock-bound. But down further the Rae Lakes cluster sits wrapped in green. My face is fried. It's been a pristine, cloudless day, so my skin is feeling the sun. The scurry up the final switchbacks to this view was fairly easy once I settled into a rhythm (and a song, which was "Mystic Rhythms" by Rush.) Soon, we'll have a bagel and cream-cheese sandwich. 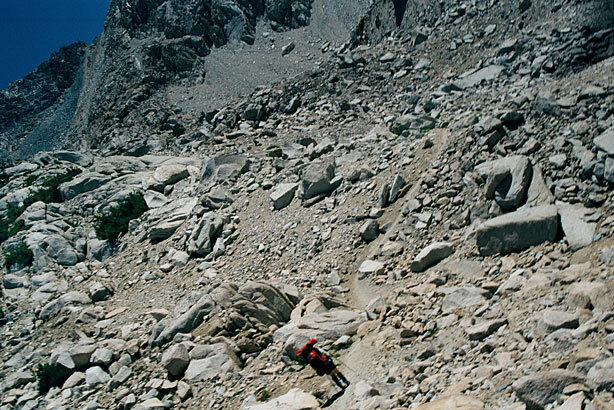 Then we'll head down the north flank of the pass and its remarkably well-designed switchbacks to the shelf below. The first part of the hike to Glen Pass was difficult with a lot of uphill. The second part was brutal but the switchbacks up the last part were not bad. I didn't even have to sit down and rest. Will and I had a bagel with cream cheese and fresh tomato at the top, then headed down. It was BRUTAL. It was steep and rocky and I was a mess and went very slowly. It took me 2 hours to descend. I started crying from exhaustion and pain near the bottom- the first time I've ever done that. Then, going over water on 2 tippy rocks, I shrieked, then got totally out of breath on an incline and was gasping, and I burst into tears and couldn't stop bawling. It was a combination of loneliness, extreme exhaustion and pain. 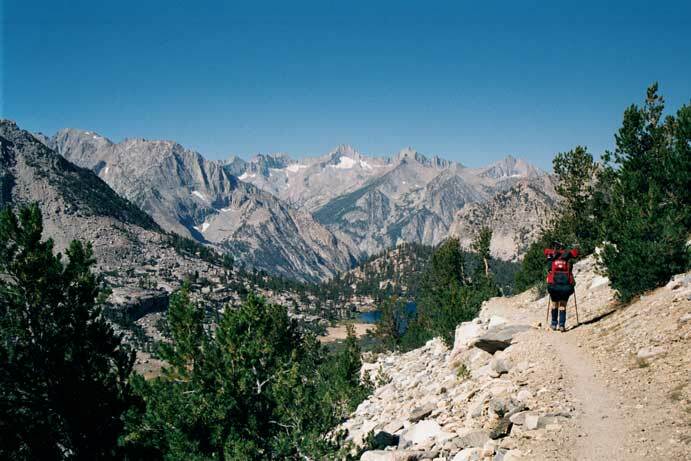 Will said he had felt similarly when he staggered into camp at Tenaya Lake last Fall. The above was written at about 1:20 PM. Mom and I had our bagels and headed down. My comment about the remarkably well-engineered switchbacks seems to have been correct.except that the engineers in question were apparently part Mountain Goat. I found them to be manageable, though a little rough on the toesies, but they mugged Mom. They held her at gunpoint and robbed her of her energy, her good humor and her will to go on. I know how she feels. 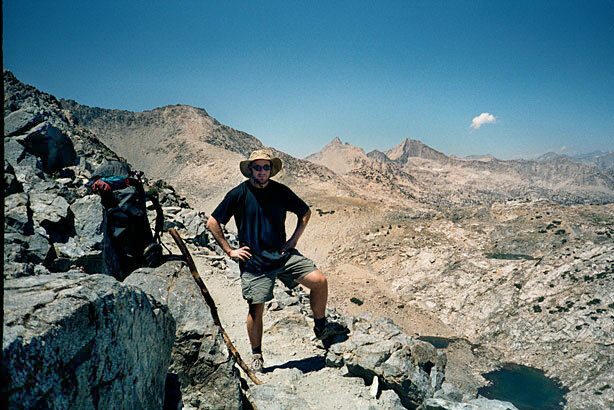 The similarity between this plunge from Glen Pass and my own journey last year from Ten Lakes in Yosemite to Tenaya Lake (sixteen miles by my own convoluted route) was that we both stumbled down the final switchbacks and found ourselves sniveling. The 48-year-old New York man who'd been our trail companion most of the day tip-toed past after I assured him everything was cool. We camped at Rae Lakes about 5-5:30, instead of Arrowhead Lake- we washed up, cooked dinner- a tasty couscous with fresh green peppers and onions (thanks to Keir and Joy) and coconut milk and curry. I am writing this now at 7:30. I will go to sleep early and hope I recover tomorrow. Now we're in a nice campsite beneath the hulk of Fin Dome. At the very northernmost of the Rae Lakes. The sun has slipped off the Dragon's Back. We've had our dinner of curry, coconut milk, green peppers and cous cous, our dessert of a single fruit gel, stashed the extra grub in the bear locker and are now in the tent. Tomorrow I'm gonna try to carry Mom's food canister in an effort to lighten her load. Now I'm off to read Somerset Maugham. Though the travel has been rough, the day has been beautiful. I took a number of great shots. The one below was an accident. During our ascent, I wanted to photograph Mom, who was just up the rocky trail. As I lifted the camera, my finger accidentally tripped the shutter. It's to be the last surviving photo my camera will take.